Robbie Horn (right) during Colin Cameron's first match as Berwick Rangers boss. Robbie Horn admitted it’s difficult to get players to sign for Berwick Rangers, especially when the club doesn’t have a competitive budget. Horn left Berwick Rangers “on good terms” after handing in his resignation, following Saturday’s 3-0 defeat to Edinburgh City. The 41-year-old boss cited health reasons as he left Shielfield, with assistant manager David Burrell following him. Horn, six years a Berwick players, was a popular manager and wished the club all the best as he left:“I have strong feelings for the club and I geniunely hope they do well in the future. The former Bonnyrigg Rose boss, who was in charge of Berwick for just over a year, added he had been ‘overwhelmed’ by the response to him resigning from his position. “I’ve had so many messages from supporters, people around the club and even people outwith the club – managers and players. Horn admitted, though, that a difficult summer, during which he had his budget for the season cut, made his job harder than it could have been. The Black and Gold won their first match of the campaign, against Stirling Albion, but Horn knew the season would be a tough one from the outset. “We agreed a budget in March and April time, which was then cut over the summer. “You build a squad on the basis of what that initial budget is, and then it wasn’t enough when you compare it to what other teams have. “When you are trying to attract players to come down to Berwick, it’s difficult, and sometimes you maybe have to pay a little bit more money but we couldn’t afford to do that. “More recently, with the changes that have happened, the board has tried to give us more money to spend, but it’s difficult to bring players in once everyone has been signed by other clubs. “It makes it difficult to get players in, and then you have to try to move players on. 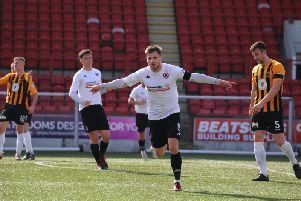 Horn named a few clubs, including former employers Bonnyrigg, who were spending money over the summer that Berwick struggled to compete with. “The likes of Edinburgh City, Spartans, Cowdenbeath, Bonnyrigg Rose and Kelty Hearts are all spending money to get players in. “Trying to get guys to come to Berwick is difficult. That’s what you face being a manager here. First team coach Myles Allan and goalkeeping coach Jim McQueen, who came to the club with Horn, will take over the managerial side of things on temporary basis. The departing boss thanked his colleagues. “I had Jim at Bonnyrigg and he feels he can’t leave Myles in the lurch – I get that. “Neither Jim nor Dave (Burrell, assistant manager) owe me anything. “They have got to do what is right for them.